I've uploaded Part One of Double Delight! I had some fun with this, and coerced DS Jeff into filming a video of me squaring up some units. It wasn't scripted, and I had a total brain warp in the middle..and my rotary cutter DID have a new blade,but it got clogged with lint inside from trimmings....so sometimes you just gotta unscrew that blade and blow it out of there! DUH! Quipped by Bonnie K. Hunter at 7:57 AM 23 Snips & Comments by others! I'm having fun going through my pictures, and this morning when I made myself a cup of tea, I thought I needed to share with you what I brought home with me! Limited baggage space, and the cost of things in Europe makes things a challenge. And my favorite thing to do? Thrift shops! So we were able to find some goodies at dutch thrift shops!! Aren't these tins great? I think the most expensive one was .50 cents SERIOUS! Thrifting is the way to go! 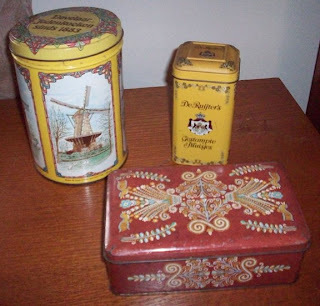 I can see the red rectangular one with the hinged lid as a sewing caddy. And it is OLD! 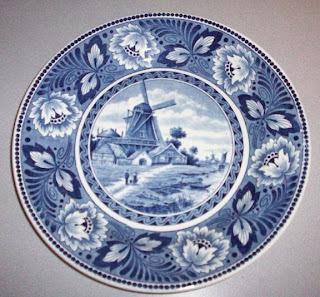 Of course the big thing when shopping in the Netherlands for us Touristas.....DELFT BLUE! This would have been expensive anywhere else,but I found it...at the thrift shop! It is now hanging in my kitchen. And what is more fun is that I have the memory of junk hunting with a good friend to add to the memories. Anyone can shop in a store....but treasure hunting with a friend? Priceless! 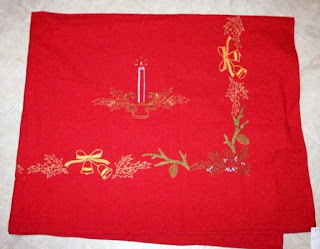 But instead, I found this hand embroidered table cloth! Someone put HOURS into stitching this, it's lovely! I only show 1/4 of it, but the design is repeated all the way around. And it was easy to pack and bring home. I had it on my table for Christmas. 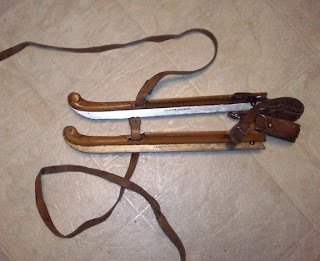 No, they are not minature samurai swords...they are antique wooden ice skates!! These were also at the thrift store. We were headed to Spakenburg, and Lucy knew of this little thrift store. We saw a table of ice skates,but no wooden ones. So she asked the guy...and these were in the back! I guess he thought no one would want these...but I do! Now they are hanging off a rack that also has a quilt on it in my front hall. 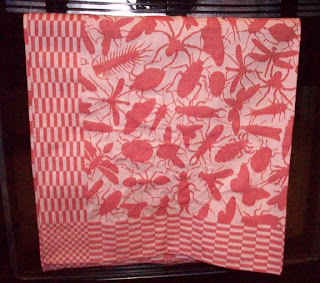 Tonya, the sweetie...found these wonderfully fun BUG dish towels in Amsterdam and gifted one to me. It's shown here hanging on my oven door. I LOVE it! It's just not the normal thing you expect to see in a kitchen. I love textiles, and these are all thread woven into this wonderful pattern. Thanks Ton! After the workshops, the shop staff,friends,and others had a small reception upstairs in the classroom area. Treats and everything! I was presented this lovely hard cover book, and it is signed inside by all the shop staff,and the shop owner. I was speechless. Believe me, it isn't often that words fail me,but they did. 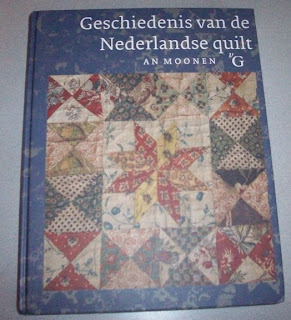 I love this book of antique dutch quilts SO much. Thank you ladies, I'll treasure it as I treasure all of you! Quipped by Bonnie K. Hunter at 11:05 AM 16 Snips & Comments by others! Quilting The New Year In!! One of our favorite movies at Christmas time is "Holiday Inn" with Bing Crosby and Fred Astaire. It's a black and white classic, and such a hoot to watch. We watch it every year. I finished quilting this a couple days ago,and the binding is on. I just need to sit and do the hand stitching on the binding and sleeve. I just couldn't make myself do it when all that was on the TV was FOOTBALL! It's not that I mind the football itself...it's the NOISE...the announcers, the crowds, the way the commercials are even broadcast louder than normal. It's like fingernails on a chalk board to me. But this is what I get being the only female in this household. So TONIGHT...I'm claiming the TV for myself right after dinner, NO FOOTBALL...and I'm binding! 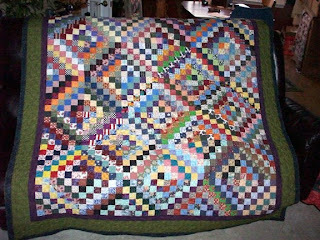 I had a hard time getting pics to turn out right...the color is most correct in the outdoor shot,but the sun is shining on the quilt, and you cant see it...so..between all of these, maybe you'll get the idea! Quipped by Bonnie K. Hunter at 11:04 AM 12 Snips & Comments by others! That would be my INTERNET CONNECTION...not me! It has been the hugest pain to get the computers back running in this house. What should be simple, just ISN'T! We also had to take back the cable modem and swap it out, and then take the router we bought back and exchange it for something else....it's been mind numbing. Not to mention I've got a very grumbly DH over the whole thing. 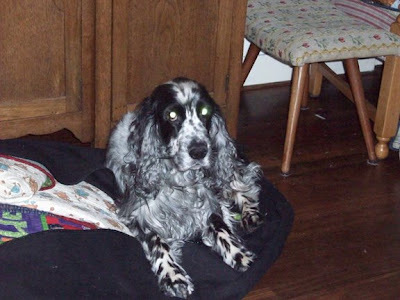 He is a lovely dog, so friendly and affectionate. And I could tell he accepted me right away, because it didn't take long for him to discover the body bag full of quilts as a great place to curl up and take a nap. I've managed to add a "printer-friendly" link to the Double Delight Intro page for those who are interested. I've been sewing the units ahead of you as you know, and I found that the amounts I had figured on the brown were VERY close, in fact, I needed a bit more, so I have upped that yardage to be 1.5 yards instead of 1 yard. I ended up using more of it than I thought due to a slight design change that improves the overall quilt design greatly! Hey, this is the design process, and I reserve the right to switch mid stream if I like it better ;c) I'm sorry if that causes anyone any problems. Remember, your browns can be scrappy, or you can even have half of one and half of another, using two browns if that works for you. I've been doing some thinking....someone asked me where my focus fabric was, and though I never thought about it much, I realize that I work a bit differently than other mystery designers. I don't work with focus fabrics! I tend to work with a color palette, using many fabrics that might not even be related to each other, other than their color family. If you asked me which was medium and which was dark....I don't even see it that way. I see colors. 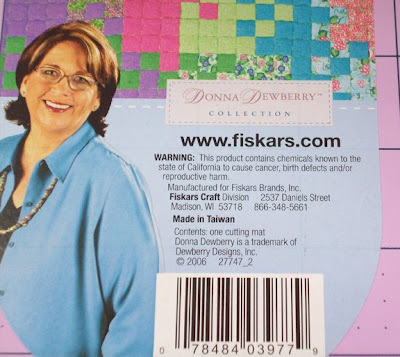 In this case, Pink, Blue, Brown, Gold (neutral as the background).....and I see pink as the dominant color, but none of the other colors come about due to what colors are printed in the pink fabrics. I just like how colors play together. If you want, you CAN choose a focus fabric, use it in place of your "gold" and choose 3 other colors from within your focus fabric to go with it. I also have used a focus fabric for pulling colors together, and then REMOVED the focus fabric, just using it as a guide to choose the others. This works really well. So it might be a funky dinosaur print you want to use as a "color guide".....because of the colors in it, but you aren't actually going to use that dinosaur fabric IN the quilt, get my drift? Tomorrow is Monday. A whole week since I came home. Why doesn't it feel like it yet? You know what I am looking forward to the most? Having the house to MYSELF on monday and tuesday before ANOTHER long holiday weekend kicks off! Quipped by Bonnie K. Hunter at 6:37 PM 7 Snips & Comments by others! Double Delight....What about the indigo?? It was brought to my attention last night that I forgot to include the amount of indigo blue for the mystery! My ftp program wasn't working so I couldn't upload my edit...I found out why...the router had died. Bllahhh. I'm hooked up on my laptop in the dining room directly to the modem. I can't upload the website from here, my files are on the other computer. But..just in case.... 3/4 a yard to 1 yard should do it..maybe a bit less....and it can be scrappy or not! The rest of the info on the mystery quilt with the other yardage requirements can be found HEREalong with a bigger pic of my chosen fabrics. 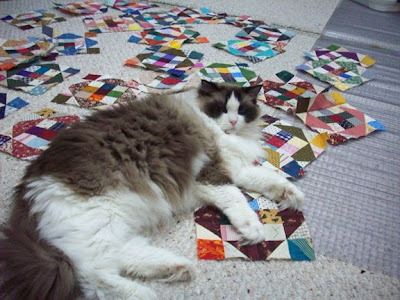 Someone posted on quiltville chat: WHAT IF I DON'T LIKE BROWN? Well, choose something else! The quilt is basically 4 colors. Pink, blue, cheddar, brown. Neutral is neutral. The law of substitution applies. Switch your colors around, but as this is a mystery, I can't help 3,000 people individually make their fabric choices. :c) So what you can do, is sit out a couple steps. See how things are coming together for others. 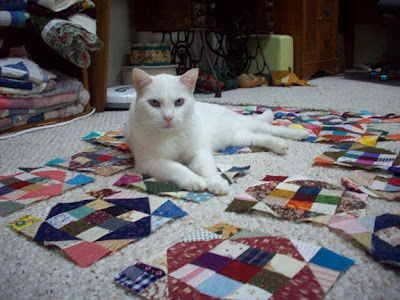 Join quiltvillechat@yahoogroups.com and see the pics in the files of what everyone else is doing, and maybe something will spark your interest. Or... you can wait a few weeks until people's quilts are DONE...and even though it won't be a mystery anymore, you'll know what goes where, make your choices, and then start sewing. So as to the burnt out wireless router? Needless to say, I'll be off to Sam's Club this morning for a new one! In the mean time, before the router went belly up, I was able to upload my windmill pics to webshots....here you go! The name of the windmill is De Zandhaas. it is in Santpoort, NL, right outside of Haarlem. It was built in 1779 (you can see the date near the top carved into the reeds that make the thatched roof). 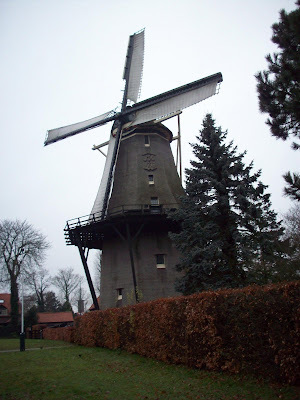 As a working windmill, it is used to grind flour. The wind turns the blades, the blades turn the stones that grind the flour. There is a little shop inside where you can buy baking items as well as the flour. It was just so quaint and lovely!! Quipped by Bonnie K. Hunter at 5:34 AM 7 Snips & Comments by others! Karen Alexander, Quilters Hall of Fame! I received an email from Karen Alexander, past president of Quilter's Hall of Fame. She is now in charge of Public Relations and asked me to post the following press release to you! Perhaps there are some of you who would really like to join in on the following challenge. quilt world beyond our libraries! on your website? I have dropped one of the latest ones in below. Unfortunately, the bio info is already outdated since I just stepped down from the Board of TQHF after 8 years, 4 as president of TQHF. But they have given me a new job --Public Relations! Thanks for you help and Happy Holidays!! quilt history, has been taking place in Marion, Indiana since 1992.
home as the headquarters of The Quilters Hall of Fame. interpret this influence in a new work. for ideas, or purchase the book "The Quilters Hall of Fame" which contains the story of each Honoree. as a special BONUS to any who join TQHF before the end of the year. Please feel free to email me if you have any further questions. Quipped by Bonnie K. Hunter at 2:04 PM 2 Snips & Comments by others! New Years Eve Mystery, Anyone? I know it's nuts. This is the way my life is.......short notice, always on the go, always at the craziest time, hey....let's do a mystery! 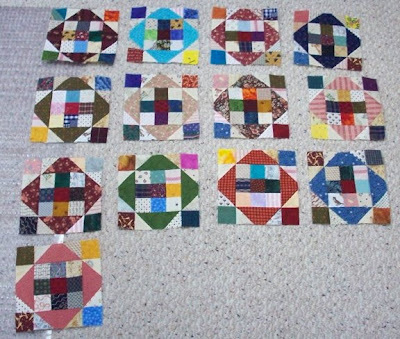 The quilt center finishes at 63.5 X 76.5 approximately. The colors I am using? Double pinks, shirtings, indigo blues, and a deep chocolate brown, and....some cheddar or gold! :cD Yes, I'm going to the strip bins first for my lights and my pinks and blues....they can be scrappy. The brown and the gold will be uniform yardage to pull every thing together. This is going to one of those where I post the steps as they are ready.....my life is going to get crazy starting mid January and who knows when it will slow down, so I can't plan it like "post one step every two weeks". It just doesn't work, but you know what? It isn't a race, and you can just go at your own pace. Leave it for 2 weeks if you want to, and come back to it. 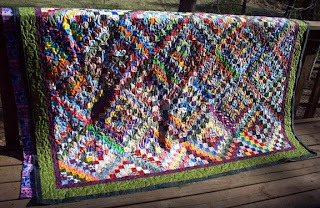 The name of this quilt? DOUBLE DELIGHT! Quipped by Bonnie K. Hunter at 10:19 AM 26 Snips & Comments by others! The ham is in the oven, the potatoes are on the stove to boil. And other than a small disaster with the garbage disposal......all has gone well here! Temps have even reached 63f! Waaaahhoooo! 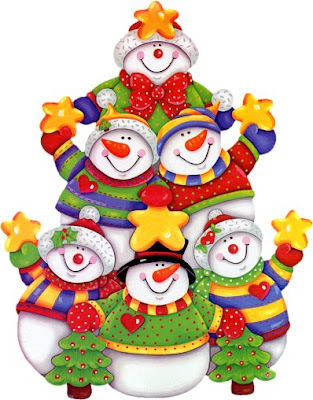 I just wanted to take a few moments and wish you all a wonderful Christmas! (and Hanukkah tomorrow) and let you know just how much you mean to me. I love how the internet has brought us all together. I am in complete awe and amazement with what an impact this technology has added to our lives. I was the one waking up at 4:45am this morning unable to sleep. So I came down here and puttered in the basement while the rest of the household slept. I've loaded a scrappy trips top into the machine, I think I might be able to do some more stitching on it tonight. 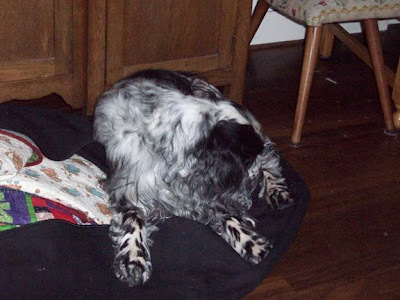 It's my goal to get some tops quilted in between now and mid January when my schedgie for 2009 takes off full throttle. Quipped by Bonnie K. Hunter at 5:19 PM 12 Snips & Comments by others! It's Christmas Eve....and I don't know where the time went! It's the body clock thing again! 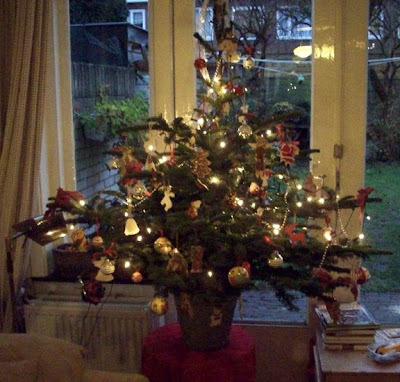 This pic is of Lucy's lovely Christmas Tree. It was so fun to help her decorate it. She tells me they always have a "REAL" tree. NOTHING smells as good as a real tree, and I agree. However..in my house...it's the fake tree. *sigh* Oh well, at least I did get it UP this year, and I didn't have to do it by myself, so I am counting my blessings! I got home monday night around midnight...just zonked. I don't remember much of yesterday (tuesday) But it included sleeping in, a late breakfast, groceries for Christmas and getting ready for company to arrive last night. Come 1am...I was so wide awake....stupid body clock! Jason and Kim are here and they brought along their friend Matt who had no where to go for Christmas. This will be nice. The Big Christmas for us this year.... is getting a new heating and air system installed in the house...TODAY! I can't believe they are doing it TODAY,but that is where we fit on their calendar. Our old system is just that...OLD...and the bills were so expensive....this new unit will pay for itself and do a better job just in the money we save. So I'm typing from my studio room, which has it's own wood stove. The rest of the house might get a bit cold today, so I'm sure I'll have company joining me in here shortly. I've uploaded the pics from the workshops into the following slide show! Quipped by Bonnie K. Hunter at 10:06 AM 21 Snips & Comments by others! I'm at the end of my whirlwind trip to Haarlem, The Netherlands! since I am at Lucy's house....I have made a post on her BLOG so you can come over and visit with us! My flight home is tomorrow, and I will be back in bed by midnight east coast time. My own bed.....ahhhhh! BLISS!! Quipped by Bonnie K. Hunter at 6:26 AM 9 Snips & Comments by others! By now, Tonya is in Amsterdam! And I'll be joining her there on Tuesday! I'm dreading this flight. Mostly because of the length of time it takes to get there. My flight is at 12:15pm here from Greensboro, but Jeff has to be to work at 10am, so he is dropping me off at the airport so I don't have to leave a car in the lot. Still, that puts me at the airport 2 1/2 hours EARLIER than I need to be. Which makes for a very long day. I fly first to Detroit, where I have ANOTHER 2 hour layover. UGH. My flight to Amsterdam is 7 hours and 40 minutes...blech blech blech. I'm going to TRY to sleep on the plane,but that has never worked for me in the past. Just too excited, too nervy, too wired! Quipped by Bonnie K. Hunter at 8:41 AM 38 Snips & Comments by others! I have very eclectic music tastes. I like everything from classical to 1970's hair bands, and everything in between including jazz, standards, disco, country, folk, celtic and instrumental. Oh, and don't forget the show tunes :c) I generally like stuff I can sing along with. The car is permanently on a station that is playing Christmas music 24/7 right now, and I definitely want..urmmm..make that NEED...the Michael Buble' Christmas Album! That man's voice can melt butter, I swear! I've been on a celtic kick lately! 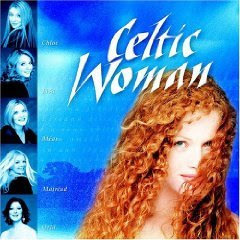 And I love the group Celtic Woman. You want to talk about "ethereal voices?" These gals have it nailed. 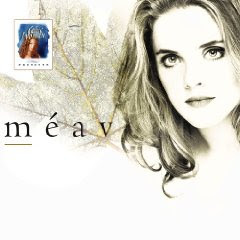 They do some fun folksy stuff, but their version of Pie Jesu and Panis Angelicus just take me away to another land, another time,nearly bringing tears. I don't know why latin does that to me, but it just does. 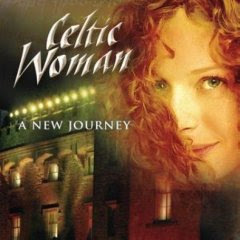 In fact, if you do a search on you tube,you will see just WHY I am just so over the moon with Celtic Woman! Quipped by Bonnie K. Hunter at 8:21 AM 16 Snips & Comments by others! Thank You, Barnes & Noble!! I'm really tickled to share this issue with Mark Lipinski, who always leaves me in stitches, and a fellow North Carolinian, Scott Murkin, whose work I love! Quipped by Bonnie K. Hunter at 4:55 PM 12 Snips & Comments by others! I was laughing to myself last night....one of those "roll over minutes" commercials came on. You know the one where the kid thinks his roll over minutes are not as good as new minutes on his cell phone? And his mom says "Some other kid would be HAPPY to have your roll over minutes!" 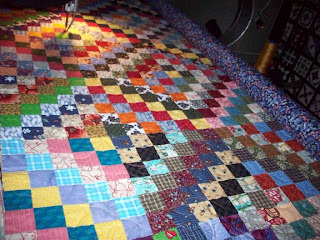 I think of my older fabrics and my scraps as my "roll overs". They are just as good as the new stuff, and even though I love the new stuff, I am just as happy making quilts out of my old stuff. My roll-over scraps. :cD Isn't that silly?! The mystery quilt center is finished, and I priority mailed it off to Quiltmaker yesterday so they can choose "new" border fabric. I guess it can't be a roll-over! All my ducks are ALMOST in a row for my trip to the Netherlands next Monday. I'm staying with Lucy, teaching two workshops, having an interview and photo shoot with Quiltmania! The folks from Quiltmania are coming all the way from France for this! Lucy, Joes, Isabeau, Me....and TONYA! What fun we are going to have! Quipped by Bonnie K. Hunter at 8:07 AM 20 Snips & Comments by others! Got Fabric Shirts & Born To Quilt Tattoos! The following message is from Leann, regarding the shirts seen below, and the tattoos! The proceeds from the shirt sales are benefiting a terrific local cause here in Winston Salem, so I hope you will support Leann with the shirt sales! If you get a girlfriend to go on in with you (or more) It will probably save some on shipping. 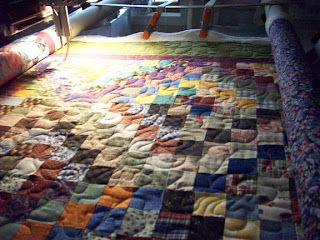 I'm working on a 3 part Mystery for future issues of Quiltmaker. I LOVE DOING THIS! The hardest part for me, is keeping it a mystery because I want to show you all SO BAD how great this is turning out. The frustrating part also,is that 3 weeks ago we decided (We being one of Quiltmaker's Editors, and myself) that we would order this special fabric direct and have it shipped to me. Two weeks later...no fabric. Turns out they were OUT of the one we wanted and neglected to tell us! We try to choose something else....no fabric. They didn't have ENOUGH. So yesterday I get word to just use what I have on hand, which is great, because I would rather deplete some of my stash.....no....scratch that.....GIVE PURPOSE to some of my stash, than add do it. But I wish we decided this THREE WEEKS AGO, because now I am under the gun to get the top finished to send off to Quiltmaker by FRIDAY. URGH. Oh well, bad use of time that couldn't be helped. I can do it! Quipped by Bonnie K. Hunter at 8:32 AM 9 Snips & Comments by others! Goodies have shown up on my doorstep! The first...with an address of "Santa Clause, North Pole, Alaska". 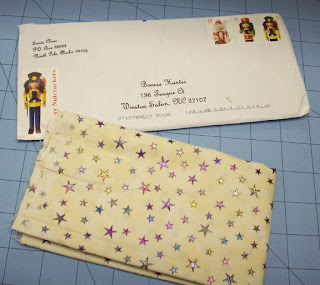 The envelope contained beautiful star scattered piece of batik, all for me! 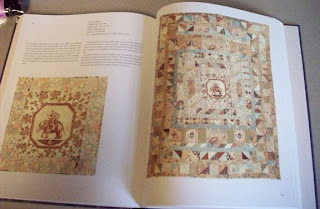 Also included was a pamphlet for a quilt show in the Netherlands in 2009, asking if I was going to be there. Unfortunately the answer is no, not this time! I wish I could,but I am scheduled to be elsewhere while that show is on. 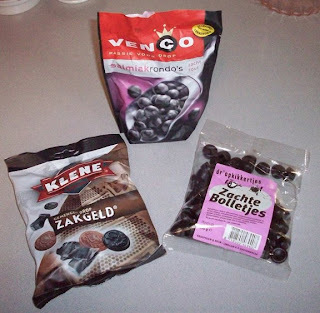 Thank you, Thank you, Santa, whoever you are! And look what Deb sent me from Battleground, MN! Remember me talking about these insulated cups and tumblers this past summer? 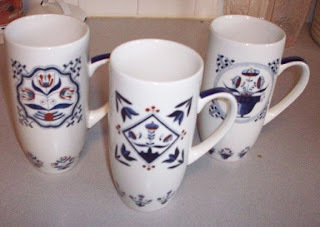 My memories of using them at my grandparent's house when I was growing up? (I always fought over the aqua colored one with my brother!) 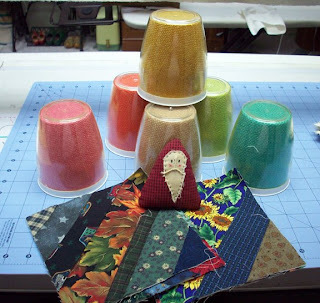 Deb has sent me some heartstring blocks to go into a charity quilt, the cutest little Santa ornament, and SIX holiday colored squatty insulated tumblers! We complimented our decor by wearing "GOT FABRIC?" Shirts with white writing on Black....and tied batik "DO RAGS" on our heads. The finishing touch? 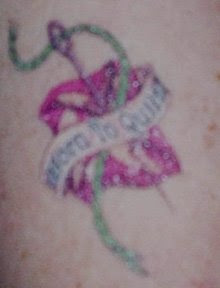 a "BORN TO QUILT" Tattoo! At the end of the night, the Born To Be Wild Santa on the Harley was donated to the 'Toys for Tots' box...and we posed for this picture. The GOT FABRIC? shirts are a fund raiser for a local cause here in Winston Salem. I've emailed Leann asking if she would like to accept mail order for the shirts if anyone is interested. I'll post again with her reply! It could be that she is already swamped and taking on a mail order thing might be a bit much for her. They sure are fun shirts, aren't they? Quipped by Bonnie K. Hunter at 12:54 PM 9 Snips & Comments by others! I went to Joanne's today, looking for bubble jet set. They didn't have any. And danged if I was going to buy those "Printed Treasures" pre treated sheets of muslin...at $18 a pack just to print labels! I usually just use my laser jet printer because the black ink on that is permanent...but...low and behold, my old trusty 1995 HP Laserjet 4p has given up the ghost. It amazes me that at the time that technology was new, the printer cost me over $900. I came home, after finding NO bubble jet set. And who wants to soak fabric to use it anyway? I looked at the pre-treated sheets of fabric... the Printed Treasures envelope says if you HAVE to wash the item, to NOT USE DETERGENT? I came home empty handed and logged into Amazon. I found a GREAT HP laserjet marked down from $224 to $99 with free shipping! I'm a happy girl. 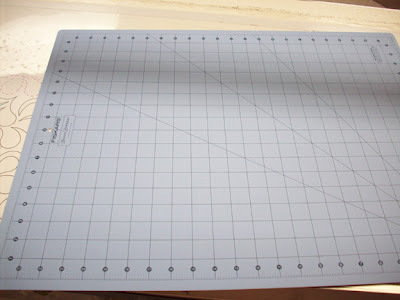 But the point of this post, isn't about the laser jet...it's about the new mat I bought at Joanne's. 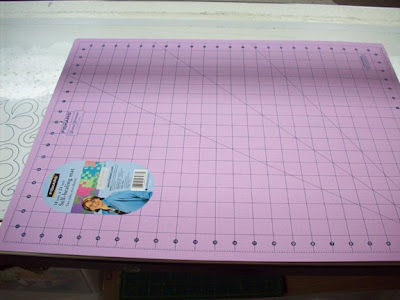 I really LIKE the Fiskars mats because they are 2 sided. It's like getting 2 mats for the price of one, and they last twice as long. When one side gets all carved up, I simply flip it and use the reverse side. It has markings on BOTH sides. WARNING: This product contains chemicals known to the state of California to cause cancer, birth defects, and/or reproductive harm. Just what ARE these chemicals in these mats and why are they in there in the first place? Are there any other brands of mats that carry the same warning? Maybe if we were to INJEST the mat particles it would be bad, but...is rotary cutting in moderation upon said mat going to be causing us any issues? Or is the chance of slicing off a finger with the cutter itself more of a likelihood than any adverse affects from chemical infused cutting mats? It's just weird. It boggles my mind. Is there anything else these could be made of to be safe to use? Or do we just chock this up to our modern world of pollutant-laced living? In my kitchen alone there are chemicals for dishwasher detergent, cleaning agents, spray cans of aerosol PAM for cooking, etc. The bathroom is much the same, the garage? Loaded with chemicals for insect repelling, antifreeze, lubricants, cans of left over paint...why should a lowly lilac and blue cutting mat push me over the edge? Quipped by Bonnie K. Hunter at 4:28 PM 30 Snips & Comments by others!